With praise from Dorie Greenspan, Jim Lahey, and David Lebovitz, the definitive bread-baking book for a new generation. But this book isn’t just about baking bread-- it’s about what to do with the slices and heels and nubs from those many loaves you’ll bake. Alexandra Stafford grew up eating her mother’s peasant bread at nearly every meal—the recipe for which was a closely-guarded family secret. When her blog, Alexandra’s Kitchen, began to grow in popularity, readers started asking how to make the bread they’d heard so much about; the bread they had seen peeking into photos. Finally, Alexandra’s mother relented, and the recipe went up on the internet. It has since inspired many who had deemed bread-baking an impossibility to give it a try, and their results have exceeded expectations. The secret is in its simplicity: the no-knead dough comes together in fewer than five minutes, rises in an hour, and after a second short rise, bakes in buttered bowls. After you master the famous peasant bread, you’ll work your way through its many variations, both in flavor (Cornmeal, Jalapeno, and Jack; Three Seed) and form (Cranberry Walnut Dinner Rolls; Cinnamon Sugar Monkey Bread). You’ll enjoy bread’s usual utilities with Food Cart Grilled Cheese and the Summer Tartine with Burrata and Avocado, but then you’ll discover its true versatility when you use it to sop up Mussels with Shallot and White Wine or juicy Roast Chicken Legs. Finally, you’ll find ways to savor every last bite, from Panzanella Salad Three Ways to Roasted Tomato Soup to No-Bake Chocolate-Coconut Cookies. "Alexandra’s book makes you want to kick over everything and spend your days in the kitchen baking simple, no-knead loaves and turning them into the best parts of every meal. Bread Toast Crumbs. The title tells you everything except how creative, practical and delicious the recipes are." "Such a fun book that I kind of wish I had written myself. Alexandra has combined creative and easy to make recipes with great know-how so anyone can make fantastic bread at home." 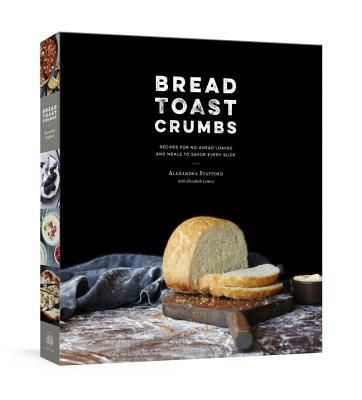 "From crusts to crumbs, from home-style, multigrain loaves to zippy shakshuka rounds, Bread Toast Crumbs presents a wide range of breads, and is the perfect guide for bakers wanting to explore the world of possibilities for making their own loaves, and using every slice and crumb that doesn't get gobbled up right away." "I am a bread baker's granddaughter. Needless to say, Ali's familial connection to bread and all of its nostalgia hits close to home. In Bread Toast Crumbs she makes the daunting feel doable: Homemade bread can be no big deal! I love all of her inventive ideas for ways to use bread (her 'Crumbs' section especially appeals to my can't-waste-a-thing heart). This book will be in heavy rotation in my house." "Does anything shout love and comfort louder than home-baked bread? Actually, yes—all of the recipes in this stunning collection do. Alexandra’s recipes are sure to inspire yeast-o-phobes and experts alike and her book is a wonderful reminder that breaking bread with people we love is literally one of the simplest and most meaningful things we can do for our families." "After trying Alexandra’s mom’s once-secret peasant bread recipe, I never wanted to start another week without it. These are the lovable, crazy-simple, and un-mess-up-able loaves that will start a new home baking revolution—and her brilliant recipes for using up every last crumb will sustain it." "As a self-professed carb enthusiast, Alexandra's beautiful book speaks to my heart. Her approachable voice gives even the most novice of bakers (myself included) encouragement that they, too, can bake and bake beautifully. Bread Toast Crumbs not only provides straightforward and inventive recipes for bread, but it gets you thinking creatively about ways to incorporate it into every meal, in every way. Simply put, I love it." "I will turn back to these pages for both the variety of beautiful loaves and the suggestion of what to make to put on top of or between its slices. Bread Toast Crumbs is a real keeper." "I can't go a single day without bread, so what a treat it was to find this beautiful book celebrating one of my favorite foods to both make and eat. It's chockablock with approachable yet sophisticated recipes that deliver mouthwatering results, from vinaigrette toasts to meatloaf made with buttermilk-soaked bread, and even breadcrumb-studded chocolate bark—a brilliant riff on the age-old snack of bread and chocolate." "Bread Toast Crumbs is part useful expertise, part gentle advice, and all heart. This book is a new essential volume for the home bread baker, and a great testament to the worth of taking something good and using it to its absolute fullest."